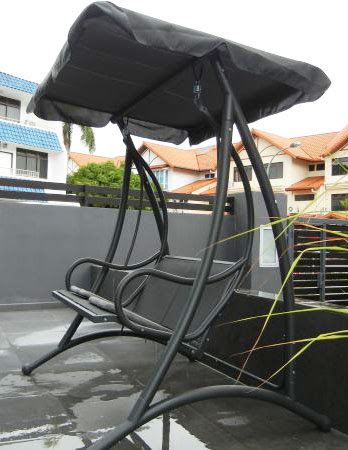 Second hand outdoor furniture up for sale, items consist of swings, tables, sofa, and chairs. Read on for more details and photos. 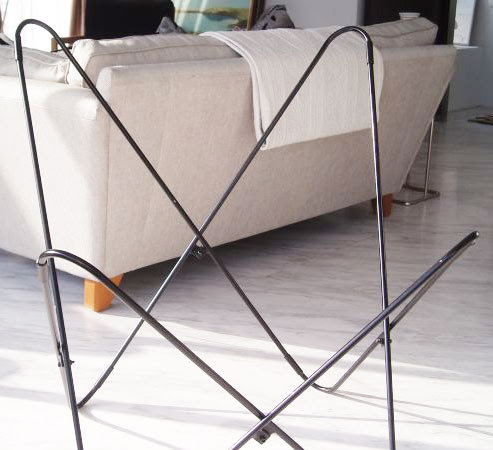 The first furniture is a modern metal garden swing, it is selling for $400. 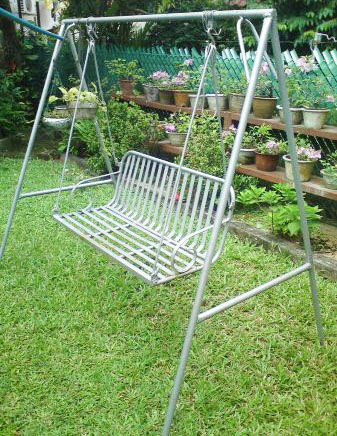 The swing is grey in colour, its design is really sleek looking, and it’ll easily fit into most urban outdoor spaces. 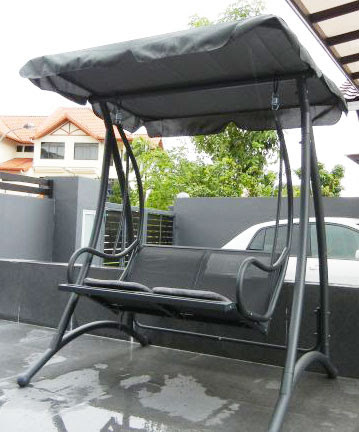 The swing is built to accommodate 2 people, it can support up to 300kg in weight. The seller says the furniture is in great condition. If you’re interested to view the item, contact the seller via email. 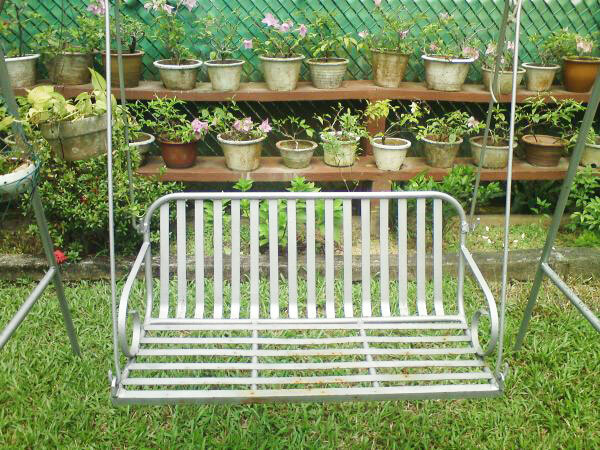 The second item is also a metal garden swing, it is selling for $399. 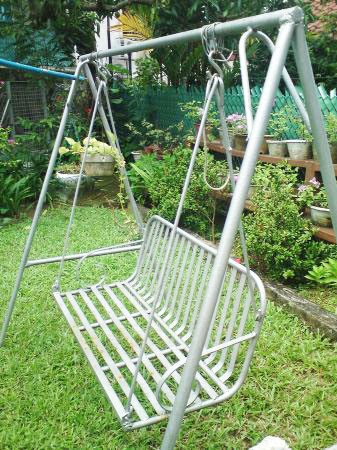 The garden swing is unpainted, and has a metallic exterior. It has a traditional and simple design, there’s nothing too fancy about the swing. There seems to be some rusting on its surface, you could probably mention that to the seller, and try to negotiate for a lower price. The swing does not look very strong or sturdy, it doesn’t look like it’ll be able to support much weight. If you are interested in viewing the item, contact the seller at 83513406. The venue to view and collect the furniture is Sin Ming. The third item is a pair of butterfly chairs, they’re selling for $425 each. The seller says the items are in great condition, and they’re quite new. The furniture is based on the original BKF butterfly chair design, the frames of the chair can be quickly assembled & disassembled, making it convenient for transportation and storage. 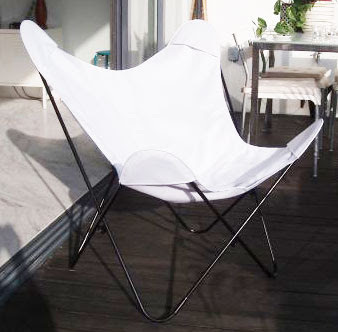 The material of the chair is white in colour, it is made of water resistant canvas. The frame of the furniture is black. The chair comes with a fabric carrying bag. You can place the chair in your balcony, porch, or patio, it’ll look great in those spaces. Interested buyers can contact the seller via email. The venue to view and collect the furniture is Newton. The fourth item is a pair of outdoor garden sofas, they’re selling for $800 altogether. The original price of the furniture was $1750 each. The sofa is able to accommodate 2 to 3 people. The seller has had the furniture for 3 years, the frame of the sofa is still in good condition. The cushions are in fair condition, they look weathered, and buyers might want to consider purchasing new cushions. 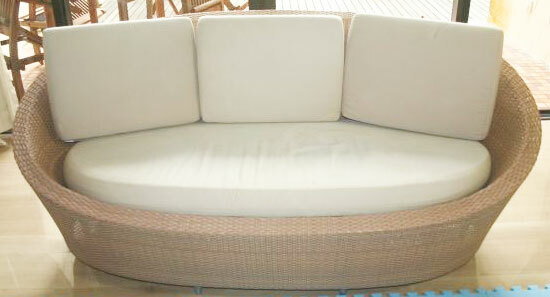 The frame of the sofa looks like it’s made of synthetic rattan or wicker weave. The body is curved in design, and overall, it looks quite elegant. Interested buyers can contact the seller via email. The venue for viewing and collection is in East Coast. 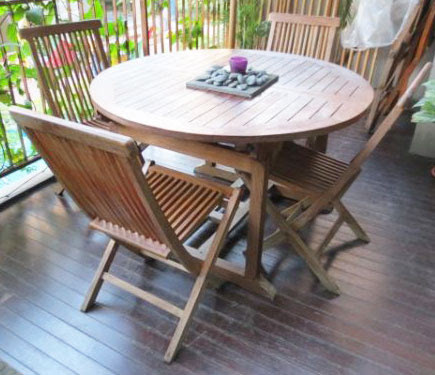 The fifth item is a 6 seater teak table, with 6 chairs. The set is selling for $550 only, it seems like quite a reasonable price. The table is extendable. When unextended, it is round in shape, and accommodates 4 people. When extended, it is oval in shape, and can accommodate 6 people around it. The seller says the furniture is in excellent condition. Interested buyers can contact the seller at 82996444. The venue to view and collect the furniture is Paya Lebar. 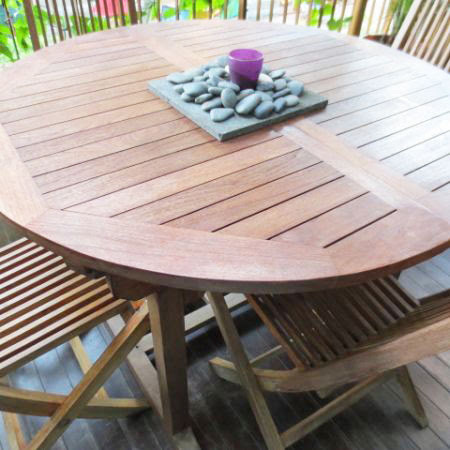 The sixth item is a 4 seater square outdoor table, with 4 chairs. It is selling for $800. The table has a glass top. Both the chairs and the table are made of synthetic rattan. 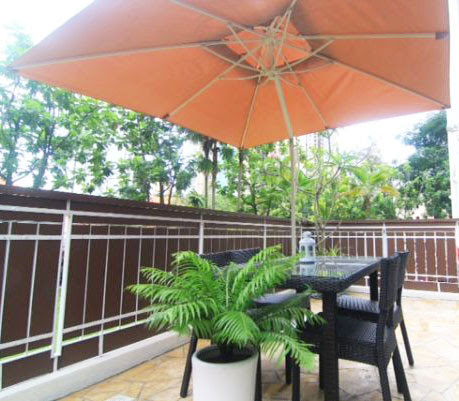 The colour of the furniture is dark brown, they are most suitable for outdoor areas. They definitely will not look nice if place inside the house. The venue to view and collect the furniture is River Valley. Interested buyers can contact the seller via email. 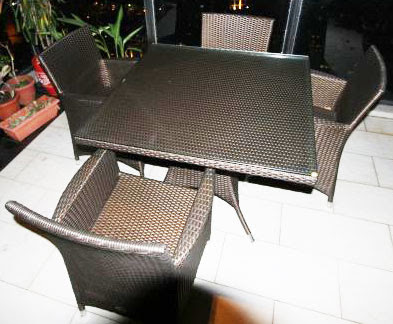 The last item is an outdoor furniture set, consisting of 1 large tempered glass top, and 6 chairs. It seems that the price is $400 for the furniture set, but the seller didn’t make it very clear. The umbrella shown in the photo is sold separately, at $400. The original price was $799. The table and chairs are made of dark brown resin wicker, and aluminium frame. The seller has had the furniture for approximately 3 months, it is still in good condition. To inquire more, contact the seller via email. Viewing and collection venue is River Valley. These items were listed on 8th February 2013. View more second hand furniture for sale.